Tackling climate change imply expenses. Some are investments, such as carbon-neutral industries and infrastructures. Others are costs, such as the political capital that you can lose if you raise taxes over fossil fuels. It doesn’t have to be so. The challenge of tackling climate change needs to be explained extensively to the population, which should be properly involved and therefore governments gain popular support for the implementation of transformative agendas like the Agenda 2030. In this case we wouldn’t see angry people wearing yellow vests in the French and Belgian streets. However, today we can fairly say that the Sustainable Development Goals and the need for a just transition towards a sustainable productive model is an unknown thing for majority of the population, especially in Europe. Most of the European political parties have been dealing with climate change as an issue only understandable to the middle-class. Yet it’s those who suffer the resulting inequalities of climate change who would be the best supporters of ambitious agendas to fight it back and ensure that society eradicate its root causes. If it rings a bell, it’s for a good reason. Once upon a time, a process called Future of Europe was meant to deal with the root causes of Brexit and relaunch the European project and dream. It’s hard to say that something happened. If so, not enough – most of the experts say today that the real debate during the campaign for the European Parliament Elections in 2019 will be the very existence and mission of the EU. Just as planet boundaries and the need to rethink our productive model was a debate left by political parties always aside in their agendas – be it for the government or the opposition – the same happened with the reflection over how to open up the decision-making process and democratise it again. Today, the European institutions are seen by many as self-referential places for some privileged politicians’ retirement rather than the transnational dimension of democracy in our societies. Somehow, the gilets jaunes embody the blind alley where political leaders and partied trapped themselves concerning every major and long-term debate. 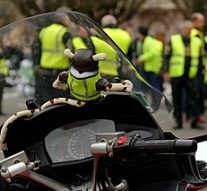 But time is ticking, and while politics watches astonished the gilets jaunes, protests against taxes on fossil fuels as much as grass-roots movements demanding degrowth are growing. We shouldn’t distinguish so sharply the former ones from those who want the EU to end and cannot believe anymore in its promises of prosperity. We shouldn’t forget that there was no time in history when the masses observed quietly profound changes. Now the question is: why do parties and decision-makers let these major issues be misused by populist narratives? It’s the future at stake. Time is ticking. Can youth really raise their vote against climate change?